The never-ending stream of tributes to the world's most famous deceased racehorse has a late entry: news that actor Brad Pitt plans to direct and star in a Broadway musical based on the Kentucky Derby winner's life and death, with music by Elton John. "I want to do this for all the people whose lives have been touched by this magnificent horse," said Mr. Pitt, "for all the children who go to bed at night snug in their Barbaro pajamas; for all the teenagers with Barbaro ringtones and tattoos; and for all the middle-age women, whether they used to ride English or western, who have turned their homes into Barbaro shrines." Test your sense of humor by a read of this blog post by racing writer Phil Maggitti. Besides, we all know that Brad Pitt is holding out for the Scott Morrison cameo role in the movie. If you are planning to attend the Fourth International Conference on Laminitis and Diseases of the Foot in Palm Beach in November, please note that it may not be possible for you to stay ath e host hotel, which is the West Palm Beach Marriott. Additional rooms for conference participants are available at the Crowne Plaza West Palm Beach. The Crowne Plaza has extended the deadline for the discounted room rate until next week. Please call 561-689-6400 for Crowne Plaza reservations and reference "Laminitis Conference"; shuttle buses will be available to take attendees back and forth to the convention center, so you should not need to rent a car. Both the Marriott and the Crowne Plaza are close to the airport. AFA Convention Chairman Greg Johnson has sent along a list of speakers for the upcoming 2008 AFA Convention in Lexington, Kentucky. This is a tentative list but should give farriers an idea of the types of presentations available: Chuck Jones, CJF (Farrier Rood & Riddle) “Shoeing the Sport Horse”; Chris Gregory, CJF, FWCF “Strategies for Passing Practical Certification Exams’; Eddie Williams, “Shoeing the Saddlebred”; Mitch Taylor, CJF “High Speed Video of Track Surfaces and Their Relationship to Toe Grabs”; Al Kane PhD, DVM, MPVM “Toe Grabs and the Effect on Race Horses”; Robert Hunt DVM “ Limb Corrections in the Juvenile Horse and the Associated Farriery Techniques”; Richelle Hochstatter, “Pros and Cons of an S Corporation and LLC, When & How”; Allie Hayes CF, “Anatomy Discussion Labs”; Charlie Helton, “ Ornamental Blacksmithing Demonstration”; AFA Certification Hands On; USDA Representative “Infectious Disease & The Relation to Farriers”; Scott Morrison DVM, TBA; Walt Taylor CF, “Professionalism in Farrier Practice”; and Brad Newman DVM, ”Acute Stage Laminitis Therapy”. 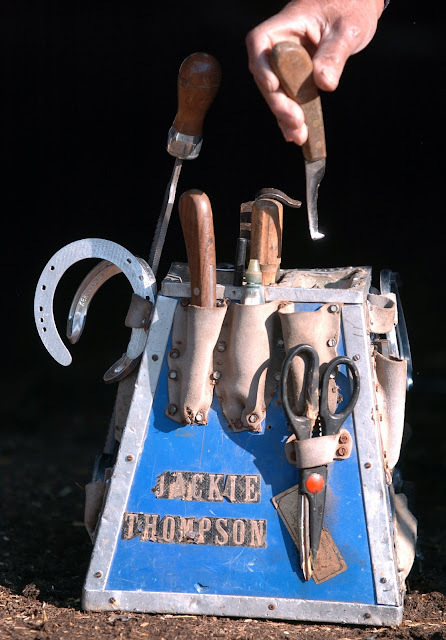 Other presentations include Round Table Discussion on Toe Grabs (Mitch Taylor, Al Kane, Steve Norman, & Thoroughbred Trainer to be announced; Buck McColl-Mini Lecture on “Nutrition”; John McNerney CJF Mini Lecture on “Tool Maintenance”; Tom Trosin CF, “How Not to Run a Farrier Business”; Horseman’s Day (Inviting owners, and trainers for Lexington Area). For more information visit, the American Farrier's Association web site. Convention dates are February 26 to March 1, 2008; the hosting chapter is the Bluegrass Horseshoers Association. The undefeated 1977 Triple Crown winner Seattle Slew defeated 1978 Triple Crown winner Affirmed in an historic race that pitted two Triple Crown winners against each other. Those were the days! For the first time in history, two Triple Crown winners met in a race, the Marlboro Cup at Belmont Park. Seattle Slew, the 1977 Triple Crown winner, defeated Affirmed, the 1978 Triple Crown winner, by three lengths. Whenever I see this photo of Seattle Slew, I'm impressed with his running style. In 1992, his son A.O. Indy would chug down the lane at Belmont Park with that same yeoman-like stride. as the forelegs came down and the hooves disappeared into the track cushion, they seemed to pull the head down too. But I think something much more subtle was going on, and these colts used their necks and heads as either another pulling body part or as a balance aid, like a gyroscope. The colt Lure ran that way too a few years after A.P. Indy and I think I saw a little bit of it in Rags to Riches, who is the daughter of A.P. Indy. How sad that the announcement of her broken ankle would come on the day of her grandfather's great triumph. Rags to Riches in her stall at Saratoga in August. Belmont Stakes winner Rags To Riches suffered a hairline fracture to her right front pastern during the running of the Grade 1, $250,000 Gazelle Stakes at Belmont Park yesterday. The filly finished second to Lear's Princess. “The injury is not career ending, and she is expected to make a full recovery. It appears as though she sustained the injury during the stretch run. When she switched to the right lead, she came off the bridle and lugged in a bit. Though she cooled out fine following the race she appeared to be slightly off this morning. Subsequent x-rays discovered the hairline fracture. She is resting comfortably and will ship to Ashford Stud tomorrow where she will receive six weeks of stall rest to give the fracture time to heal. At the conclusion of her convalescence she will be re-x-rayed to determine when she will resume training. She will not race again until 2008." Yesterday’s running of the Gazelle was the filly’s first race since her historic win over Preakness winner Curlin in the Belmont Stakes, June 9. That win catapulted her into the history books, as she became one of only three fillies to win the coveted “Test of the Champion” and the first to do so in 102 years. Thanks to the NTRA and Kelly Wietsma of Todd Pletcher Racing for help with this post. Dr. Chris Pollitt of the University of Queensland's Australian Equine Laminitis Research Unit took camera in hand on his rounds of the sick horses quarantined at the scene an FEI Eventing World Cup qualifier in Warwick, Queensland. Dr. Pollitt's daughter Jane was to have ridden in the event; her Australian stock horse Washington is the fleabitten gray in the purple halter you will see in the video. Be sure to check the web site of The Australian Equine Laminitis Research Unit to learn more about Dr. Pollitt's work with another disease. He will be headed to the USA in a few weeks for an extended lecture tour, culminating in the 4th International Equine Conference on Laminitis and Diseases of the Horse's Foot in West Palm Beach, Florida on November 2-4. See you there! Sydney farrier Stephen Head, as seen in the Herald Sun, is forced into unemployment until the horse flu quarantine is lifted. Stephen Head is one of the best and the brightest of Sydney-area farriers. With the shutdown of Sydney's Randwick Racecourse and all horse events in the state of New South Wales, he has resigned himself to the fact he will have no income this month. And perhaps not next month, either. Or the month after. The quarantine extends 30 days after the last horse shows symptoms of the flu, or is diagnosed. While the farriers in the quarantine states of Queensland and New South Wales could travel to Melbourne Adelaide or Western Australia, where races, breeding, and horse shows can go on (although no one knows for how long), it would mean leaving behind their families. 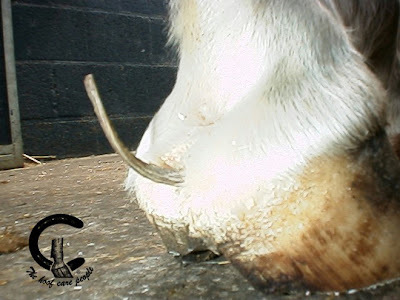 While hooves will continue to grow during the quarantine, the farriers aren't being allowed into farms and tracks and showgrounds except for emergency care. That means that when the ban is lifted, all the horses will need to be trimmed and shod t the same time. In fact, they will all be overdue. How do you spell s-t-r-e-s-s? In Australia, farriers are registered with their state governments. They are eligible for some government assistance in this time of crisis. "If things go to plan, maybe next month I'll get about 40 per cent of what I'd normally earn, and the month after that I'm assuming my income will be back to normal. "The cruel thing is that this period is normally our best three months of the year. We can't get that back now." In the meantime, Mr Head has had plenty of time to look at his finances. He has had his mortgage payments suspended, his children's school fees suspended, and he has been in contact with the finance company about getting the car lease payments suspended. "The bank and the school were both sympathetic. I think that if you contact them first and tell them of your difficulties they will be very tolerant. "The next thing I have to do is contact the Taxation Department to suspend payments to them because I don't know what the cash flow is going to be like." He also doesn't know what is going to happen with his two young apprentices. "For the past week they've been in the blacksmith shop honing their skills in shoemaking," he said. "Now they're on two weeks' holiday." After that he's uncertain. He's had someone come by from the Department of Education and Training to talk about options, one of which is letting them go, but that's something he'd rather not do. Meanwhile, he has been wondering how he could have done things differently. "The big thing for people is to have loss of profit insurance, which I don't have," he said. "The other thing is to have savings to help you ride this thing out." In another report, farrier Bob Sim says the impact of the virus has been devastating for his family. “I basically lost probably 90 per cent of my income, to the extent that we actually had to go to the bank yesterday and ask them to put a freeze on my mortgage because I can’t pay it,” he said. By the way, Bob is one of 18 members of the American Farrier's Association who live in the two affected states, according to the most recent AFA member directory. The University of Tennessee and the Tennessee Walking Horse Breeders’ and Exhibitors’ AssociationSM (TWHBEA) have announced that they are working together to develop and secure funding for a balance and mobility study to analyze the natural gait of the Tennessee Walking Horse. "The Tennessee Walking Horse industry provides a very significant economic impact and much recognition for our state,” said Dr. Alan Mathew, head of the Department of Animal Science at the University of Tennessee. “As Tennessee’s Land Grant University, we are delighted to have this opportunity to collaborate with TWHBEA to provide expertise and science-based information for the benefit of Walking Horse owners, trainers, pleasure riders, and others involved with this unique breed." Using high performance 3-D cameras and analysis from judges and veterinarians coupled with genetic markers, study implementers would be able to record the gait of today’s Tennessee Walking Horses in different disciplines. Historical films will be used to analyze the natural movements of the breed at its inception. Study implementers will then compare the motion of the breed’s foundation horses to the motion and mobility of today’s Tennessee Walking Horses. “We are very excited about the information this study could provide us and its potential use to help preserve the historic gait of our breed,” said Chuck Cadle, executive director of the TWHBEA. The study would also analyze potential differences in horses’ weight distribution based on the way they are shod. “Certainly there’s a natural evolution in the performance of show horses through breeding and improved training methods, but this study will finally help us determine if today’s horses are still in synch with the natural gait of this breed,” said Dr. Mathew. Cadle continued, “We base breeding decisions on performance in the show ring, and that may not be the best way to preserve the natural gait of this breed. This study will help us make the best breeding decisions so we don’t dilute our population and compromise the gait that makes our horse famous. If the study could be initiated within the year, it could be completed by 2011. TWHBEA and UT intend to seek funds for the project and are willing to discuss it with interested parties. If anyone is counting, Jackie shod five Derby winners--Dark Star, Proud Clarion, Dust Commander, Gato del Sol and Swale. More importantly, he taught people to be farriers by taking them on as apprentices. One of the best Jackie stories is when he took on a white apprentice, the first in Lexington. He went around to all the trainers at Keeneland to make sure it was all right with them if a white man helped him work on their horses. Services are Monday, September 10 at Shiloh Baptist Church in Lexington, Kentucky. The Lexington Herald-Leader has a nice obituary of Jackie, who was 81. 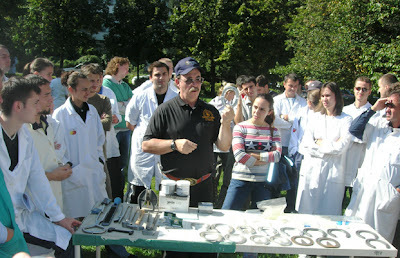 Farrier Jim Keith instructs vet students about the role of farriers in equine health and medicine. Jim Keith of Wingate, Indiana is the ninth recipient of the Clyde Stringer Award, presented by the Indian Farriers Association for service in education and teaching farriery. When Jim was the president of the Indiana Farriers Association, he appointed a committee to set the award up. This year, he was chosen by his peers to receive the award. Jim, who is 61, teaches educational clinics and a yearly class at Purdue University for veterinary students on shoeing horses. He has taught at universities in Romania, and is going back to Romania and Hungary with Christian Veterinary Missions in October to present farrier courses. Jim has subscribed to Hoofcare and Lameness Journal since 1986. He's a worthy recipient of the award and we congratulate him! Clyde Stringer is former president of the Indiana Farriers Association. He is retired from shoeing and recently had knee surgery. The IFA also has the Al Morgan Award, named for one of the organization's foundation who died ten years ago, for volunteer service. These photos illustrate the same condition, although these two horses had different ways of displaying it. Do you know what this is? I didn't, until I read the new book Hoof Problems by Rob Van Nassau. The European answer to Chris Pollitt's Color Atlas of the Horse's Foot has finally been translated into English. And would you trim it off with your nippers? Obviously some farriers didn't want to touch these growths. How appropriate that this book should arrive at "back to school" time. It certainly jump-started my curiosity for the odd and unusual problems that affect hooves. All I can think of is that the author haunts the slaughterhouses looking for worst-case scenario hoof problems. And he found them. This first US copy of Hoof Problems arrived today and I went right to the page where these photos can be found. I had been puzzling over them in the Dutch version and I could finally read the captions so I know what Rob Van Nassau says caused this. Do you? If you are stumped, as I was, and just want a copy of the book, send $45 plus $6 post by email (Visa/MasterCard) or by check to Hoofcare, 19 Harbor Loop, Gloucester MA 01930. Fax orders to 978 283 8775. Postage outside the USA is $12 to most countries. The books are due here in the next month or so. Book specs: 225 pages, 1000 photos, all color, indexed, hardcover, 8x11" approx; foreword by Simon Curtis. Australian laminitis researcher Dr. Chris Pollitt was in Brazil last week on a lecture tour when news of the Equine Influenza (EI) outbreak back home hit the news. He was soon on his way back to the University of Queensland to help at the vet school. The EI outbreak had a double meaning for Dr. Pollitt. It was a professional emergency for the university and the nation but his daughter, Jane, was at an Olympic qualifier 3-day event in Warwick, Queensland. She and her horse were under lockdown orders because horses on the grounds started to show symptoms of the disease. As far as I know, she is still there. Dr. Pollitt donned a sterile suit and went to work at the event. 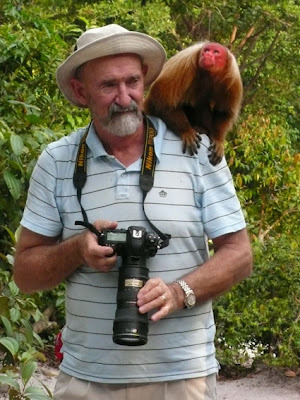 The red-faced monkey stayed in Brazil. The proper id for this obliging model in Portuguese is Macaco de Cara Vermelha (Red Face Monkey in English). I highly recommend a summary article about the show, posted on the web site of the Tennessean newspaper in Nashville, Tennessee, to which the above photo of one of the amateur classes is linked. (There's also a slide show of images there.) The paper notes that 24,000 people were at the show. There is no good news out of Australia today, either. Read this chilling account of how a farrier and vet are being made scapegoats for the inability of police horses to be used for crowd control at the global APEC meeting in Sydney. Once one police horse became sick, the entire stable was locked down.